Sourcing new bonsai can be difficult unless you are lucky enough to live near a bonsai nursery. With the advent of online bonsai nurseries and Ebay, buying bonsai on the internet has become more common place in the past few years. Most bonsai bought online have to be delivered to the buyer via the Postal Service in your country. Many people are rightly nervous of the condition that an expensive bonsai may reach them if it has been transported via a courier. However, if well packaged, there is no reason why a bonsai cannot be transported by courier without incurring any damage. Having sent and received many bonsai through the UK Royal Mail, I believe that the method of packaging bonsai described in this article is as failsafe as is reasonably possible. This is a small Larch group planting I recently sold. 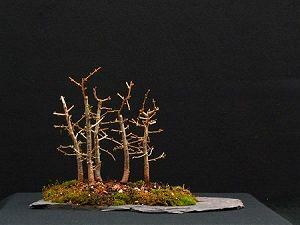 Planted onto a flat piece of slate it was probably more difficult to send than a typical bonsai planted in a pot. With a minimum of one or two days in the postal system, the planting is thoroughly watered; this is especially important during the warm Summer months as the soil must not dry out before the trees reach their destination. The first stage is to wrap the soil and rootball in plastic, using adhesive tape to secure the plastic into position. Not only does the plastic secure the soil into the pot during transit but it also holds the moisture within the soil. 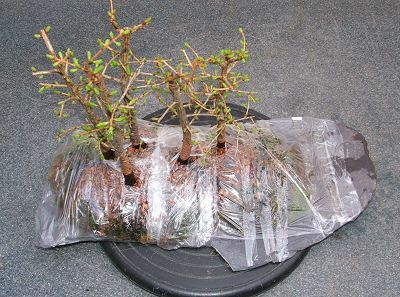 Though all bonsai should already be well secured into their pots, the tightly wrapped plastic also ensures that the tree is held securely into the pot (or in this case, on the slab).